If the automotive world progressed as fast as the computer industry, the old joke goes, we‘d all have $1,000 cars that get 400 miles to the gallon, never need maintenance, and crash catastrophic-ally every eight weeks for no reason. Ancient punch lines aside, comparing this year's storage options to those of even half a decade ago would be like entering a Bugatti Type 35 in the Preakness Stakes. Half a decade ago, we were all still chasing the fastest mechanical hard drive. Today, solid-state drives are where the action is. And the progress made in SSDs over the past three years has been staggering. During our first SSD roundup in November 2008, the cream of the crop offered sustained-read and -write speeds on par with a mechanical drive, at 20 times the cost, and most were much worse. In 2009 and 2010, the first really excellent consumer SSDs arrived, powered by Indilinx's Barefoot controller, SandForce's SF-1200, as well as Intel's and Samsung's proprietary controllers. 2011's crop of controllers brings 6Gb/s SATA support, enabling much faster transfer speeds. Some are also using smaller-process NAND. Marvell's 9174 controller (the one from last year's Crucial C300) powers three of the drives in our roundup, while the fourth is the first SF-2200 drive we've been able to get our hands on. Where's the best bang for your buck? Does 6Gb/s SATA really make a difference? And who would ever buy a horseless carriage? Will the new SandForce SF-2200 controller in the Vertex 3 dominate the field the way its predecessor did? The other SSDs here hope not. Virtually the same drive that Micron is selling to OEMs with the RealSSD C400 moniker, the Crucial m4 is the follow-up to the C300 6Gb/s SSD. In a surprise move, Intel enters the 6Gb/s field with a third-party controller-the same Marvell 9174 powering all but one of the drives here-instead of one of its own. Plextor has yet to make a name for itself in the SSD market after debuting with the unimpressive M1S. Perhaps the new Marvell 9174 controller will help it out. Regular readers of our drive reviews might notice a few changes in our benchmark chart at the end of the article. HDTune and HD Tach, the low-level drive benchmarks, are gone, replaced by CrystalDiskMark, AS SSD, and ATTO. Several factors played into this decision. First, the low-level benchmarks work on the raw disk level, on unformatted and unpartitioned drives. This is useful on rotary drives, but less so on solid-state ones. 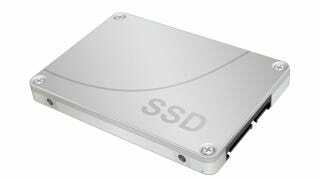 CrystalDisk-Mark and AS SSD are designed from the ground up to test solid-state storage at the partition level, which better mirrors real-world use. AS SSD's 4KB low-queue-depth random benchmark gives results that match well with HDTune's, while CrystalDiskMark's 32QD 4KB read and write benchmarks parse well with Iometer's, giving another level of robustness to our storage tests. ATTO shows read and write speeds for a wide array of different block sizes; we use 64KB as a good middle-of-the-road benchmark. Premiere Pro and PCMark Vantage, as real-world tests, remain in our toolbox. AS SSD is built from the ground up to measure SSD performance. We still ran HD Tach and HDTune on all the drives in this review, but the end results were not as useful as those from CrystalDiskMark and AS SSD. We've also moved our SSD test bed to a Sandy Bridge motherboard-Asus's P8P67 Pro with the B3 chipset. Our previous test bed was based on the X58 chipset, which used a Marvell 6Gb/s SATA controller. The P67 chipset's native Intel 6Gb/s offers better, more stable 6Gb/s SATA performance. Some amount of wheeling and dealing got OCZ access to special firmware for its last-gen SandForce drives, enabling faster random-write performance than the competition. Despite OCZ's recent acquisition of Indilinx, it seems there's still a spark to OCZ's relationship with SandForce, as the company was able to get us an SF-2200 drive before anyone else. Since the Vertex 3 is the first SF-2200–powered SSD we've tested, we don't know how it compares to the rest of the SF-2200 field, but we do know it kicks the pants off of most every other SSD we've reviewed. OCZ retains the solid-state crown with stellar overall performance. The Vertex 3 uses 25nm-process NAND and, like all SandForce drives, no cache. That SF-2200 controller really cooks, setting records in most of our benchmarks and performing competitively in the rest. No single drive in our roundup matches the Vertex 3 on all fronts, though the Crucial m4 is close in random read/write performance and the Intel 510 comes close to its sequential reads and surpasses its sequential writes. OCZ continues its tradition of blazing-fast random-write performance, both at low- and high-queue depths, serving up more than 85,000 IOPS in our Iometer QD32 4KB random-write test. That's nearly 80 percent faster than the Vertex 2, the previous SATA champion. It's too early to tell whether the rest of the SF-2200 lineup will be able to compete with OCZ's Vertex 3. But for the few weeks until we get our hands on more next-gen SandForce drives, the Vertex 3 reigns supreme. At first blush, the Crucial m4 seems virtually indistinguishable from its predecessor, the Crucial RealSSD C300. After all, it's available in the same capacity with the same Marvell 9174 6Gb/s SATA controller and same amount of DRAM cache-256MB for the 128GB, 256GB, and 512GB versions, and 128MB for the 64GB drive. What's the difference between the Crucial m4 and a Micron RealSSD C400? Branding. That isn't to say the Crucial m4 is identical to the C300. For one thing, the m4's firmware has been substantially updated from the sometimes-flaky firmware of the C300. For another, the m4 uses 25nm-process NAND, while the C300 used 34nm NAND. Smaller-process NAND means lower cost per gigabyte (thus, cheaper SSDs), but with a slight durability hit, albeit one probably unnoticeable to the end user. In our tests, the m4 (and every drive in this roundup) positively smoked our best-of-the-best 3Gb/s SATA drive, the OCZ Vertex 2-sustained- read and -write scores as measured by Crystal-DiskMark and AS SSD were more than twice the Vertex 2's scores, and the m4 scored higher 4KB random reads and writes across the board, from single-queue depth to QD 32. The 256MB of cache doubtless helped the m4 in PCMark Vantage's HDD subtest, where it posted the highest score we've seen from a non–PCI-E drive. The m4 doesn't have the fastest sustained speeds, but its random-access speeds are top-notch. And 400MB/s reads and 250MB/s writes would have been unthinkably fast a couple of months ago. The Crucial m4 represents a great implementation of the Marvell 9174 controller, and a great demonstration of the advantage of native 6Gb/s SATA. Intel's new SSD, powered by... Marvell? Nobody panic. Intel is still coming out with its much-delayed third-generation solid-state drive. The 320 Series will use 25nm NAND and Intel's latest controller, on 3Gb/s SATA, and will focus on what made Intel drives great: high read speeds and random writes, and rock-solid reliability. Intel, recognizing that 250MB/s read speeds ain't gonna cut it in 2011 (and holy cow, do we love typing that), is also bowing to popular demand and releasing an SSD with 6Gb/s SATA capability, but rather than design its own controller for that, Intel is using a third-party component. Intel wouldn't officially tell us which controller, but thanks to the mysterious and powerful technol-ogy known as screwdriver, we can say with confidence that it's Marvell's 88SS9174-BKK2. Intel's 510 SSD isn't part of the same family as its X25-M drives, but it's special in its own way. Intel's 510 Series SSD uses 34nm Intel NAND chips and 128MB DDR3 DRAM cache-and, of course, the same 6Gb/s Marvell 9174 controller as the Crucial and Plextor drives. The 250GB model that we tested showed the strongest sustained-write speeds of any drive in our roundup-more than 300MB/s-and its sustained reads of more than 480MB/s bested every Marvell-based drive. But its 4KB random-read and -write speeds, at any queue depth, were good by 2009's standards, but no match for Crucial's offering or either of the last- or current-gen Vertex drives. If you go solely by sequential-read and -write speeds, the Intel 510 is one of the fastest drives we've ever tested, but its random-read and -write performance lags far behind the front-runners. By splitting its SSD line into two segments (3Gb/s SATA, random-write-centric versus 6Gb/s, sequential-speed-centric), Intel risks having two less-than-compelling options. And in a crowded field, consumers might not go with either one, especially given the jaw-dropping $614 street price of the 250GB 510 Series SSD. Second verse, better than the first! We'll say this for the Plextor M2 Series SSD: It's a huge step up from Plextor's last SSD. The M1S Series SSD we tested in our June 2010 roundup used Marvell's "Da-Vinci" 88SS8014-BHP2 controller, which suffered from instability and slow writes. We gave that drive a 5 verdict. To our great relief, the M2 series SSD instead uses Marvell's newer 6Gb/s SATA controller, the 88SS9174-BLD2-marking the third appearance of a Marvell 9174 controller in this roundup. With the M2 series, Plextor pairs the Marvell 9174 controller with 128MB of DDR3 DRAM cache, and the result is an undeniable improvement over its previous-gen drive. As reported by Crystal-DiskMark and AS SSD, sustained reads hover near 400MB/s, with sustained writes around half that. That's around double the read speed of the OCZ Vertex 2, but 25MB/s slower than the Vertex 2's write speed. 4KB random reads and writes also suffered in comparison to the Vertex 2. Plextor's M2 series manages to up the company's SSD track record from abysmal to middlin'. The Plextor M2 is much better than Plextor's last SSD, and in many benchmarks it's superior to last generation's top drives-mostly in read speeds. But its write speeds and random-access times lag behind the other 6Gb/s SATA drives in our roundup, and even high-performing drives from last year. The M2, like Plextor's last drive, comes with a copy of Acronis True Image Home to ease your transition from a smaller or slower drive, which is nice. If you're shopping for your first SSD, Plextor's M2 makes a decent offering. But it's not the best of what's available in the 6Gb/s SATA SSD market-or even the best Marvell-controlled drive. Are you contemplating buying a brand-new solid-state drive, but worried that your motherboard is draggin' you down? Even if your motherboard has no 6Gb/s SATA ports (or, like many X58 boards, has a crappy onboard 6Gb/s SATA controller), you can still benefit from running a 6Gb/s SATA drive. See, most last-gen drives had to deal with the 3Gb/s SATA interface, which tops out in the real world at around 250MB/s, so there was no incentive to push performance. But 6Gb/s drives don't have that limitation-they're built to far surpass it. And though you won't see 400MB/s read speeds on a 3Gb/s SATA port, you can still push closer to the 3Gb/s barrier with a current-gen drive than you can with a last-gen one. We tested OCZ's Vertex 3 6Gb/s SATA drive on our test bed's 3Gb/s SATA controller, and found that it far surpassed the Vertex 2 that was our previous champion, offering sustained-read and -write speeds around 260MB/s and 220MB/s, respectively. Even constrained by the 3Gb/s SATA interface, the Vertex 3 matched or bested the Vertex 2 in nearly every benchmark. The performance difference on 3Gb/s SATA isn't so great that you should upgrade to a current-gen SSD if you're already rocking a SandForce 1200, Intel, or Samsung drive and you don't have 6Gb/s SATA ports available. But if you're in the market for your first SSD and still rocking a last-gen motherboard, don't rule out 6Gb/s SATA drives. If your current mobo can't take advantage of all that speed, your next mobo can. Or you can grab a PCI-E-to-6Gb/s SATA host bus adapter, like HighPoint's Rocket 600 series, to get 6Gb/s SATA on your current board. We've been anxiously awaiting the SF-2200 controller for a while-could the company that sprung out of stealth mode to take the solid-state drive market by storm in 2010 pull a repeat in 2011? Though we're still a few months away from seeing multiple vendors shipping SF-2200 drives, if the performance of the OCZ Vertex 3 is any indication, it's going to be another good year for SandForce. The SandForce-powered OCZ Vertex 3 is the clear winner of our little roundup, posting race-winning scores in virtually every benchmark. In CrystalDiskMark and AS SSD, which are solid-state-specific synthetic benchmarks, the Vertex 3 posted average sequential reads of 500MB/s and average writes of 280MB/s, second only to the Intel 510. In queue-depth 32 4KB random-read and -write benchmarks (both Crystal-DiskMark and Iometer), the Vertex 3 again bested the rest of the field, though Crucial's m4 SSD came within spitting distance of OCZ's drive. PCMark Vantage, which mirrors real-world applications, actually gives the top spot to Crucial's m4 SSD, with the Vertex 3 a close second. One interesting result our testing shows is the importance of good firmware. Three of the drives in our roundup share the same Marvell 9174 controller (albeit with varying amounts of cache), but they all post different benchmark results. Intel's 510 shows the strongest sequential-read and -write scores by far, but its random-access scores are no better than those of the Plextor M2. Crucial's m4, on the other hand, shows random-read and -write speeds almost as high as the Vertex 3, but its sequential speeds were much lower than the Intel or OCZ drives. Intel's and Crucial's offerings each excel in at least one area, while the Plextor M2 is competent compared to last-gen drives but unexceptional compared to this generation. We should make explicit that any of these solid-state drives deserves your purchasing consideration. They're all powerful performers that really take advantage of the increased bandwidth of the 6Gb/s SATA bus. Depending on your needs, either Crucial's or Intel's drives should be near the top of your list, though the OCZ Vertex 3 combines the best features of each—for a price. Asterisk (*) denotes highest score. Our current test bed is a 3.1GHz Core i3-2100 processor on an Asus P8 P67 Pro (B3 chipset) running Windows 7 Professional 64-bit. All tests used onboard 6Gb/s SATA ports with latest Intel drivers, except 3Gb/s SATA tests, which used onboard 3Gb/s Intel SATA ports.